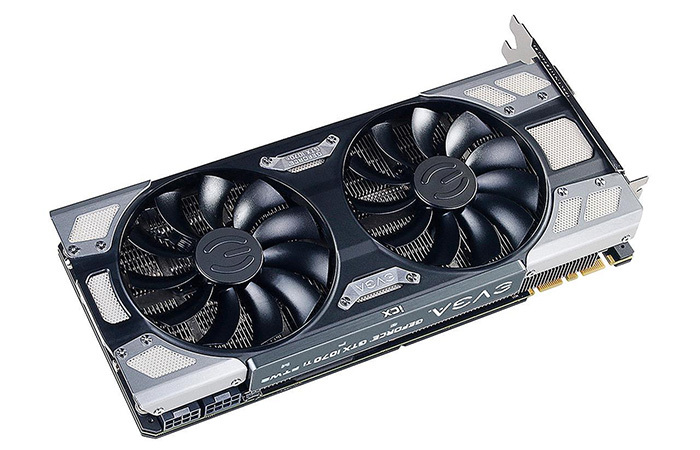 It really was only a matter of time until we took a a look at how Nvidia stalwart EVGA envisioned the GeForce GTX 1070 Ti. The reality is that the company has four such offerings, even including a watercooled hybrid version which is at odds with the Nvidia mandate that no partner can overclock their cards out of the gate, for fear that such a card would heavily tread on the toes of the GeForce GTX 1080. What this means for you, the consumer, is that each and every GeForce GTX 1070 Ti you lay peepers on is clocked in at the same speeds. 2,432 shaders operate at base and boost speeds of 1,607MHz and 1,683MHz, respectively, while 8GB of GDDR5 memory hums along at 8Gbps. Each add-in board partner hints at overclocking potential by suffixing their cards with a +, indicating there is plenty more in the tank, but it is up to the user to eke out the extra. In the air-cooled department reside the single-fan Gaming ($450), the twin-fan SC Gaming ($470), and the ICX-equipped FTW2 Gaming ($499), in for review today. On first glance you may wonder why pay the extra for the FTW2 when it looks similar to the SC Gaming, but the devil is in the details. This premier air-cooled card measures the same 266mm long but uses a much larger heatsink assembly, standing an extra 17mm tall. The extra height enables EVGA to install a couple of 100mm fans that switch off at low loads and, given the 10-sensor ICX technology underneath, are able to spin at different speeds, depending upon just where the heat build-up is. 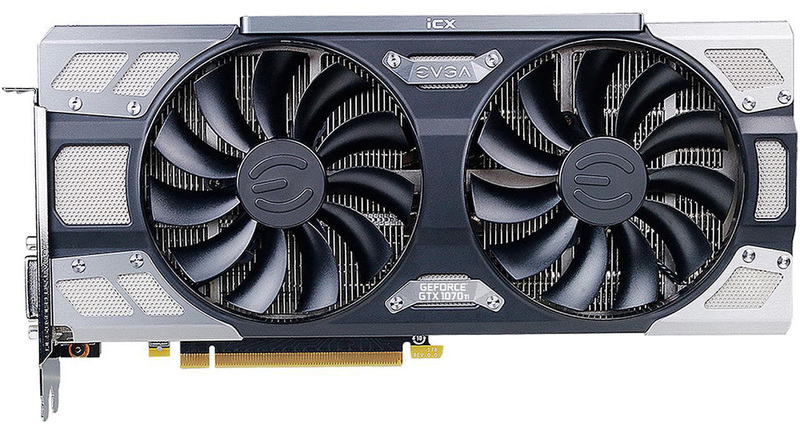 This card's cooling is a carbon copy of the GTX 1080 version's, as far as we can discern. The chunkier cooler is good enough reason for EVGA to increase the card's TDP from 217W on the SC Gaming to 235W here. In practise this ought to mean the card runs at a higher boost speed than its immediate brethren. Keeping in with ICX features, there's a second BIOS and a 10+2-phase power supply, as well. Another benefit of going down the FTW2 route is the card-wide, die-cast backplate/heatsink, not available on other air-cooled models. Having extra cooling capability means that EVGA increases the power resource by adding two 8-pin connectors, though such a move feels like overkill on a GPU of this speed. FTW2 also has an RGB side panel that can be set to one of many colours or patterns, or off if you prefer, and this feature is limited to this model - other LED-bearing EVGA cards have the choice of white or off. The way in which the honeycomb heatsink pattern is constructed allows for much of the RGB light to filter through and outside, giving off more of an effect than placing a few LEDs here and there. EVGA's in-house Precision X software controls both lighting and speeds. Underneath, another die-cast plate sits between cooler and GPU, and it also sensibly covers the VRM components and memory in one fell swoop. The heatsink itself uses four 6mm and two 8mm heatpipes for cooling duties, and if past results are anything to go by, we expect to see load temperatures of around 70°C... accompanied by very little noise. The FTW2 cooler clearly uses a PCB that's larger than the standard bracket. The open-air nature of the overall design is such that air is mostly recirculated within the chassis, so there's little coming out of the vents on the rear. Outputs are a standard Nvidia quintet of dual-link DVI, triple DisplayPort and HDMI. Backed by a standard three-year warranty and available from UK retailers for £500 at the time of writing, this card's main claim to fame is better-than-reference cooling and ICX-based monitoring. The real proof of its pudding will be seeing how far it can go when overclocking, but before we do that, let's run some standard benchmarks.